Seaweeds are well-known to be important primary producers in coastal waters, but they may potentially also play a role in providing refuge from ocean acidification. Macroalgaes such as Laminariales and Fucales, both of which are brown algaes, are ecosystem engineers that influence factors such as water velocity, light penetration, and chemical characteristics of seawater (e.g. via carbonate chemistry, and oxygen and nutrient availability). Figure 1. A) Ecklonia radiata. B) ephiphyte. While epiphytes come in many shapes and sizes, ranging from looking like hair and snot, to being delicate and flowerlike, they normally grow on top of another plant. Note the epiphyte shown in B is not the epiphyte found on Ecklonia radiata in this study. The diffusive boundary layer (DBL) exists at the surface of the leaf blade and is the area of the most rapid and variable fluctuations. The DBL is formed when a fluid moves over a solid and no-slip conditions create a region of viscously-dominated laminar flow. Here movement of ions and molecules is by molecular diffusion and the metabolic activity of the organism, in this case, seaweeds, creates a concentration gradient from the uptake and release of dissolved substances to and from the surface of the leaf blade. DBL microenvironments are not only important in the transfer of nutrients and metabolites but are also critical for timing of gamete release and keeping antifouling agents at the blade’s surface. Many organisms such as bacteria, diatoms, various larvae, annelids, and other algae live in this layer. Over the next century the pH of seawater, on average world-wide, is expected to be reduced by 0 .1-0.3 units. While this change seems to be small, this is in fact quite drastic and will greatly impact corals and their ability to pull calcium carbonate from the water, which is the major component of their exoskeletons. The goal of this study, from Noisette and Hurd (2018), was to: a) study the characteristics of thickness and concentration gradient of DBL at the blade surface of Ecklonia radiata and b) determine the characteristics of DBL in predicted future conditions. Eighty blades of algae were taken from in situ locations in Hobart, Tasmania, Australia. In the lab, the blades were kept at 13°C and in low light conditions. Different combinations of light, mainstream pH, flow, and epiphytic conditions were evaluated with four blade replicates. Data was then analyzed for significance using three-way ANOVAs with pH, flow, and presence/absence of epiphytes. A three-way MANOVA was then used to compare coefficients of curves fitted to the profiles. Figure 2. Shows DBL thickness in various treatments of pH, presence of epiphytes, and flow rates. It was found that pH did not affect DBL while flow and epiphyte presence did. DBL was thicker in slow flow conditions, as well in epiphytic conditions. It was also found that oxygen profiles were steeper in fast flow treatments. Noisette and Hurd also found that epiphytes decreased the oxygen content of the DBL under dark conditions. It was noted in particular that DBL thickness increased in slow flow because the DBL of the blade and epiphytes actually merged. Metabolic activity of both epiphytes and algae led to variations in oxygen concentration and pH in the DBL which offers potential refuge from future ocean acidification. While blades with epiphytes did have larger DBLs, net photosynthesis was lower due to epiphytes using oxygen produced by the algae and potential shading of the algae that might reduce the efficiency of photosynthesis. Noisette and Hurd mention that organisms that regularly encounter strong fluctuations, like nearshore algae, might be better able to survive a lower pH of seawater due to higher phenotypic plasticity. DBLs might thus act as refuges for calcifiers and other organisms by allowing them to adapt to lower pH conditions over time. While this offers some room for adaptation of important oceanic organisms, it comes on a small scale. This could be the difference between complete breakdown of ecosystems and hanging on by a thread. Noisette F & Hurd C. (2018). Abiotic and biotic interactions in the diffusive boundary layer of kelp blades create a potential refuge from ocean acidification. Functional Ecology, 32.5: 1329-1342. Mysticetes (baleen whales) arguably fall under the category of charismatic marine megafauna, capable of drawing the public’s attention to their conservation concern. However, many species are in quite a bit of trouble. Injury and mortality from entanglement with fishing gear is a problem that affects whales worldwide (Knowlton et al, 2016). It is perhaps one of the greatest concerns for the North Atlantic right whale, and is the second largest leading cause of death (Knowlton and Kraus, 2001). With only about 500 individual North Atlantic right whales left (Stills, 2017), conservation is urgently required to ensure the survival of the species. Number of North Atlantic right whales with minor or moderate-severe entanglements (Knowlton et al, 2016). Much of the conservation for these whales surrounds lessening the amount of entangled gear on the whales that have already been entangled and lessening the amount of gear in which they may get entangled. Thus far, the United States has had limited success (Stills, 2017) and observed deaths of both right and humpback whales have exceeded the potential biological removal levels defined by the United States government (Knowlton et al, 2016). Figure 1 depicts the increasing number of North Atlantic right whales that are becoming entangled. While minor entanglements make up the majority of entanglements, the increasing number of moderate-severe entanglements is also increasing. With so few individuals remaining, every death is devastating. Deaths from entanglement are caused from instantaneous drowning, delayed death from impaired feeding, increased energy demands due to the drag of gear, and stress (Knowlton et al, 2016). Figure two shows in depiction A) a whale that would experience impeded feeding and in depiction B) a whale that would experience increased swimming efforts due to the drag of gear. Pettis et al (2014) found that stress responses to entanglement can affect the health of a whale even after gear has been removed. Van der Hoop et al (2013) found that entangled gear increased the power requirements of North Atlantic right whales by 70-102%. Two possible configuration of gear on entangled North Atlantic right whales. Dashed lines are used to depict line on the underside of the animal (Van der Hoop et al, 2016). The current efforts have focused on the reduction of rope within the water column (Knowlton et al, 2016). Knowlton et al (2016) studied the effects of fishing rope strength on large baleen whales, focusing on North Atlantic right whales and humpback whales. The purpose of the study done by Knowlton et al (2016) was to analyze the properties of ropes removed from whales and to examine rope characteristics in relation to species, age, and injury severity. Knowing rope deterioration rate and breaking strength is important because a certain amount of drag from entangled gear can be used by a whale to free itself (Van der Hoop et al, 2016), thus this knowledge can be used to create reduced breaking strength ropes that can effectively be used for fishing but will lessen the morality of large baleen whales. Gear samples analyzed in this study were recovered by the Atlantic Large Whale Disentanglement Network, with most samples being taken from free-swimming or anchored entangled whales (Knowlton et al, 2016). The gear was assessed for the following characteristics: diameter, material and fiber type, condition, estimated breaking strength, and strength of a new rope of the same type and diameter (Knowlton et al 2016). The severity of entanglement and the configuration of the gear, for the most part, were assessed by photographs (Knowlton et al, 2016). Per each whale used in this study, there was an average of 1.83 ropes and the condition of the rope for the majority of cases was classified as good to very good (Knowlton et al, 2016). The average breaking strength of rope entangling a North Atantic right whales was 19.30 kN, for humpback whales was 17.13 kN, and for minke whales was 10.47 kN (Knowlton et al, 2016). Knowlton et al (2016) found no adult North Atlantic right whales entangled in ropes below a breaking strength of 20.02 kN, which suggests that they can break free or disentangle themselves from the weaker ropes. Several of the most dangerous aspects of entanglements for whales are infections caused by the rope cutting into their bodies, increased demands in energy requirements of swimming, and restricted feeding (Van der Hoop et al, 2016). Knowlton et al (2016) suggest that the use of reduced breaking strength rope could reduce mortality. While entanglements may not be prevented, the stress and numbers of mortality could lessen if ropes are easier for the whales to break free from. Knowlton et al (2016) do note that reduced breaking strength ropes would not prevent lethal entanglements in some areas such as calving grounds. Thus a conservation plan that reduces gear on already entangled whales, reduces the amount of gear in the water, and enforces use of reduced breaking strength ropes will be the most effective. Hoop, Julie M. Van Der, et al. “Drag from fishing gear entangling North Atlantic right whales.” Marine Mammal Science, vol. 32, no. 2, Sept. 2015, pp. 619–642. Hoop, Julie Van Der, et al. “Behavioral impacts of disentanglement of a right whale under sedation and the energetic cost of entanglement.” Marine Mammal Science, vol. 30, no. 1, 2013, pp. 282–307. Amy Knowlton, and Scott Kraus. “Mortality and serious injury of northern right whales (Eubalaena glacialis) in the western North Atlantic Ocean.” Journal of Cetacean Research Management, no. 2, 2001, pp. 193–208. Knowlton, Amy R., et al. “Effects of fishing rope strength on the severity of large whale entanglements.” Conservation Biology, vol. 30, no. 2, Jan. 2015, pp. 318–328. Pettis, Heather M, et al. “Visual health assessment of North Atlantic right whales (Eubalaena glacialis) using photographs.” Canadian Journal of Zoology, vol. 82, no. 1, 2004, pp. 8–19. Stills, Jennifer, editor. “North Atlantic right whales in danger.” Science, 10 Nov. 2017, pp. 730–731. 1. What’s your role in the lab? Hey guys, I’m Emily! I’ve been working with the Shark Research Team at the University of Miami for about 4 years now. During my time with the RJ Dunlap program I have been involved with a number of projects. I have been the shark satellite tracking coordinator since 2013. I am responsible for keeping track of all our satellite tagged sharks. Nightly, I receive emails that indicate which of our sharks have transmitted throughout the day. Using a number of different databases I can then examine the location and movement of animals. From here, the tracks are updated on our website so the public can view the animal’s movement in near real time. The information we receive from these tags is used for numerous research projects going on in the lab to further enhance shark conservation. My current research involves looking at the movement patterns of tiger sharks and comparing it to a number of different morphological variables. In particular, we are trying to determine what exactly (i.e. tail size, body condition, reproductive status) determines how far, how fast, and where an individual will move. I received my Bachelor of Science Degree in Marine and Atmospheric Science at the University of Miami, Rosenstiel School of Marine and Atmospheric Science in 2014 and will be starting work towards my Masters of Science in Marine Affairs and Policy with Dr. Hammerschlag in Fall 2015. Outside of the lab, I can probably be found tutoring (I love working with kids) or playing with my dogs and cats. I love avocados, water skiing, concerts, Blackhawks hockey, and driving across the Rickenbacker Causeway. 3. How did you get interested in marine biology and conservation? For as long as I can remember I have wanted to spend my life working with the ocean and the amazing creatures within it, forcing me out of my land-locked home town of Chicago. 4. What’s your favorite part about working in the lab? Working with the shark team at RSMAS has been one of the best experiences of my life. The adrenaline rush that comes after successfully completing a work up on a 350 centimeter tiger shark in the Bahamas is indescribable. Running statistical tests on a new set of data and finding a significant result is super exciting. However, the best part about being a member of this lab is the team I am surrounded by. It is an honor to work alongside some of the most talented and passionate people in the field. I am lucky to be able to learn something new from my colleagues every day and even luckier to call them some of my best friends. Older, female fish are becoming a necessity for the continuation of trophy-fish hunting and sustainable commercial fishing. Looking at both freshwater and saltwater species, the presence of larger, more mature fish increases the productivity and stability of fish populations. Dr. Mark Hixon, of the University of Hawai’i at Manoa, refers to the loss of big fish as “size and age truncation.” Big, old, fat, fertile, female fish, affectionately nicknamed BOFFFFs, have proved the ability to produce significantly more eggs than younger fish. They also can spawn at different times and places, allowing them the option of evading potential predators and threats to their offspring. Efforts to protect older, larger fish include creation of marine reserves, which act as no-take zones. Marine reserves allow fish to spawn throughout their entire lives. As large fish, BOFFFFs are a valuable commodity in commercial fishing, as fisheries tend to target marketable commodities. This specified targeting alters a fishery’s modes and methods: through the narrowing of mesh size or gear type. Drift nets and long lines are used in the removal of larger fish from certain populations. To some extent, even bait type and hook affects the type of fish caught. Slot limits are placed on commercial fisheries, limiting them to catching only medium-sized fish. Although egg size variation among a single species may be narrow, across a diverse range, significant maternal effects have been noted in terms of larger egg size. More mature females produce more, and often larger, eggs that typically develop into larvae that can withstand more intense challenges like starvation and have a faster growth rate. This is partly due to the physical body size, as a larger fish translates to a wider body cavity to allow for the development of larger ovaries. BOFFFFs have a tendency towards earlier and longer spawning seasons. With this flexibility, these fish can withhold spawning in unfavorable conditions. Once the danger of predation, or other threats, has passed, BOFFFFs can spawn abundantly and improve recruitment. Hixon refers to this phenomenon as the storage effect. This ability is preferential when considering commercial and differential fishing. The targeted removal of BOFFFFs results in a truncation of size and age structure of a specific population. The removal of older fish from an overfished population will increase their probability of species collapse. The assumption that younger female fish contribute equally to production and stock is detrimental to the future of sustainable fishery stocks. Fishery productivity would find stability in the implementation of old-growth age structures. Berkeley suggested three methods to limit the overfishing of BOFFFFs: slot size limits with both minimums and maximums, low rates of fishing mortality, and marine reserves. This can be accomplished with enforcement of both marine reserve no-take zones as well as catch limits. Marine reserves act not only as a direct safe place for fish to thrive and procreate, but also as a healthy influence on surrounding waters. They give maturing fish an area to develop, spawn and seed nearby fisheries. Marine reserves act to provide ecosystems and environments for fish to not only reach sexual maturity, but past that. In addition, larvae from healthy marine reserves are found to seed the areas directly adjacent. This will assist in the replenishment of overfished and exploited populations. By integrating large-scale marine reserves, it is believed that it is possible to halt and reverse the decline of global fisheries while also protecting marine teleost, mammal, and invertebrate species. The decrease in mortality due to the protection of species by marine reserves and the subsequent increase in productivity has been seen in both temperate and tropical locations. Since marine reserves are located along reefs, estuaries, and kelp beds, it provides a large range in the protection of a diversity of species. In a study conducted by Steven Berkeley et al, featuring 20 female black rockfish (Sebastes melanops), from five to seventeen years, it was found that larval groups from the older females grew three times faster than their counterparts. Larvae from the older fish also survived starvation twice as long. According to Berkeley, this is due to the provision of larvae with energy-rich triaglycerol (TAG) lipids as they increase in age. The TAG volume found in oil globules is positively correlated with age, growth rate, and survival. However, maternal effects can’t be classified as consistent across every species of teleost fish. Instead, research indicates that maternal effects have developed across a diverse taxonomic range. With the removal of matured female fish, populations are more likely to develop damaging consequences in terms of biodiversity and productivity. Berkeley, Steven A., Mark A. Hixon, Ralph J. Larson, and Milton S. Love. “Fisheries Sustainability via Protection of Age Structure and Spatial Distribution of Fish Populations.” Fisheries 85.5: 23-32. Print. Gell, Fiona R., and Callum M. Roberts. “Benefits beyond Boundaries: The Fishery Effects of Marine Reserves.” Trends in Ecology & Evolution 18.9: 448-55. Print. Hixon, M. A., Johnson, D.W., and Sogard, S. M. BOFFFFs: on the importance of conserving old-growth age structure in fishery populations. – ICES Journal of Marine Science, 71: 2171–2185. Can Facebook be used to increase scientific literacy? With the rising popularity in social media, more and more scientists are using social media platforms for education and outreach. The case study “Can Facebook be used to increase scientific literacy?” aims to investigate how effective Facebook is when it comes to educating people about the oceans. Facebook is an excellent platform for fostering communication between scientists and citizens, thus also making it easier for experts to inform the general public about current issues. It has been observed that users find learning through Facebook fun, but how effective is this method as a platform for learning? “Can Facebook be used to increase scientific literacy?” focuses on the Monterey Bay Aquarium Research Institute (MBARI). MBARI, is a private marine research institute that specializes in the innovation of technology for the purpose of studying the ocean. Aiming to increase the number of people reached per post, MBARI decided to change their posting strategy. This included posting at different times, and changing the type of media posted along with a few other factors. The results and conclusions discussed in this case study, compare their new finding to their previous numbers. All data used in this case study came directly from MBARI’s Facebook page. MBARI also found a correlation between the amount of words used and the number of people reached. However, most of their long texts were associated with photos, whereas short text was associated with links, thus making it difficult to argue that this had a direct impact on the reach. Apart from this, the data also showed that the organic reach on a given day increases by 18.26% if a story is posted the day before. /wp-content/uploads/sites/28/2014/12/image1.png 552 1096 l.vandermeiden https://blog1.miami.edu/sharklab/wp-content/uploads/sites/28/2018/09/Um-Shark-Research-logo-2018.jpg l.vandermeiden2015-01-12 09:44:192015-01-12 09:44:19Can Facebook be used to increase scientific literacy? Saturday’s trip looked like it would be a gloomy one with overcast and rain. I was excited for the catered trip, but I left for Crandon Marina with a sense of dread. The prospect of tagging sharks in choppy waters and cold rain did not thrill me. However, once the RJD team loaded the Diver’s Paradise, the skies cleared up a little. After Captain Eric and Neil went over safety and gear deployment, members of the Alumni Association and the RJD team introduced themselves. As we left for Soldier Key, the skies completely cleared, and I breathed a sigh of relief. The day was absolutely gorgeous. With help from the Alumni Association, we deployed our gear quickly and took environmentals. We went for a brief swim, and afterwards Neil gave a great talk explaining our shark workup and the value of our research. With everyone now prepared, we returned to check our lines. On our first line of the day we caught a nurse shark, and luckily for us, it was a fairly calm one. With help from members of the Alumni Association, we quickly performed the workup and released the nurse shark. We also caught nurse sharks on lines four and seven, but unfortunately, the nurse shark on four unhooked itself and swam away before we could get it on the platform. The shark on line seven had the largest head on a nurse shark that I have ever seen, and it was so feisty we did not bother trying to take blood. With three nurse sharks in the first set of lines, I was prepared for a long day filled with bruising battles. Nevertheless, I was content as the delicious catered lunch would sooth any pain. Picture: Measuring the nurse shark. Caption: A participant helps us measure a nurse shark. However, my prediction was not correct as we only caught one more shark during the trip. A large lemon shark, about nine feet long, waited for us on the last line of the second round. Again, we quickly performed our workup and got the shark back into the water. I was glad members of the Alumni Association got a chance to feel the real roughness of sharkskin, because nurse sharks have comparatively smooth skin. Lemon shark with pump. Caption: A member of the RJD team removes the water pump from the lemon shark’s mouth as we prepare it for release. Although we did not catch any more sharks, our last catch of the day happened to be a barracuda in the third round of drumlines. We reeled it in and saved it to use as bait for the following day’s trip. Overall, we had a great day on the water, and I was glad alumni were able to come on board and participate in our research. Global climate change, among other anthropogenic issues, is becoming an increasingly significant threat to the Arctic region of the world. Specifically, higher average temperatures and rapidly disappearing sea ice are of conservation concern for ice-dependent species. Arctic marine mammals are specifically adapted to take advantage of the climatic conditions that have prevailed in the Arctic for millions of years, and have been a target of conservation based on their role in the functioning of Arctic ecosystems and surrounding communities. Despite these conservation concerns, with impacts of climate change likely to worsen in coming decades, there is increased industrial interest in Arctic areas previously covered by ice. A graph showing the evident decline in average monthly arctic sea ice extent from September 1979 through 2012 (Reeves et al). In a recent study, scientists observed and mapped the distribution and movement patterns of three ice-associated cetacean (marine mammal) species that reside year-round in the Arctic: the Narwhal (Monodon monceros), Beluga (white whale, Delphinapterus leucas), and Bowhead Whale (Balaena mysticetus) (Reeves et al. 2013). Then they used these ranges and compared them to current and future activity sites related to oil and gas deposits, exploration, development and commercial shipping routes, to assess areas of overlap, as a means of highlighting areas in the Arctic that might be of conservation concern. Some of the results indicated the sensitivity of Bowhead whales to industrial activity; the sensitivity of Narwhals to climate change and noise, as well as a shift in distribution due to ice conditions; and the sensitivity of Beluga whales to noise, as well as a wider distribution extending into the sub arctic (Reeves et al. 2013). These observations ultimately triggered the need for a better understanding of the implications of environmental changes in the Arctic for cetacean species, in order to develop effective conservation and management policies (Reeves et al. 2013). Poorly documented shipping routes and operations, in addition to accelerating Artic pressures in Arctic Norway, Arctic Russia, the Alaskan Arctic, Arctic Canada and Arctic Greenland, indicate that immediate measures need to be taken to mitigate the impacts of human activities on these Arctic whales, as well as the people who depend on them (Reeves et al. 2013). As indicated by researchers, some of these measures include: careful planning of ship traffic lanes (re-routing if necessary) and ship speed restrictions; temporal or spatial closures of specified areas (e.g. where critical processes for whales such as calving, calf rearing, resting, or intense feeding take place) to specific types of industrial activity; strict regulation of seismic surveys and other sources of loud underwater noise; and close and sustained monitoring of whale populations in order to track their responses to environmental disturbance (Reeves et al. 2013). After comparing maps of Arctic whale ranges with maps of recent and anticipated oil and gas activity and shipping traffic in the Arctic, researchers noticed the unquestionable overlap between Arctic whales and harmful human activities. Based on unparalleled current and predicted rates of climate change, the futures of these three Arctic whale species are uncertain. Based on the significance of these species, both culturally and for proper functioning of the Arctic ecosystem, well-informed management decisions related to human activities will be imperative going forward. Reeves et al. Distribution of endemic cetaceans in relation to hydrocarbon development and commercial shipping in a warming Arctic. Marine Policy 44 (2014). “Narwhals Breach.” WikiMedia Commons. WikiMedia, 1 Oct. 2012. Web. 29 Jan. 2014. Fish living in the “twilight zone” have a greater biomass than previously thought. Mesopelagic fish, fish living at depths between 200 and 1000 meters in the ocean, reside in water with very low levels of light. Although they are typically small, mesopelagic fish constitute the largest biomass of fish in the world because of their immense numbers. Previous estimates state that there are about 1,000 million tons of mesopelagic fish worldwide. However, using data collected on the Malaspina 2010 Circumnavigation Expedition, Irigoien et al. 2014 show that there are about 10 times more mesopelagic fish than previously estimated. Such an increase in an already massive fish community alters how we determine the role mesopelagic fish play in ocean food webs and chemical cycling. Previously, scientists pulled nets behind their boats in a process called trawling in order to capture fish and estimate their populations. This process is not efficient in catching mesopelagic fish and leads to an underestimation of their numbers. Instead of trawling, scientists aboard the Malaspina 2010 used an echosounder, a type of SONAR, to determine the biomass of mesopelagic fish. 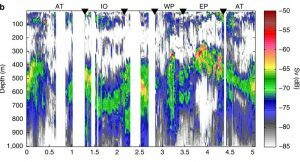 In this method, the echosounder emits a pulse of sound into the water and records the sound that returns after bouncing off an object. Using sound to weight ratios previously determined in other studies, Irigoien et al. 2014 were able to estimate the mesopelagic fish biomass from the recorded acoustic data. Irigoin et al. 2014 then used food web models to corroborate the estimate given by the acoustic data. Their estimates determined the mesopelagic biomass to be about 10-15,000 million tons, about 10 times higher than previous estimates. Irigoien et al. 2014 also found that mesopelagic biomass is closely tied to the plankton, miniscule, floating organisms of the ocean, that undergo photosynthesis. These photosynthetic plankton form the base of the marine food web, and other, larger plankton consume them. Mesopelagic fish then feed on these herbivorous plankton. In the open ocean, where nutrients are poor, herbivorous plankton do not efficiently capture photosynthetic plankton. This implies that fish will not efficiently obtain their energy, which ultimately comes from the photosynthetic plankton. However, Irigoien et al. 2014 contest that the transfer of energy to the mesopelagic fish is more efficient in the open ocean because the water is warm and clear, allowing the visual fish to more easily capture their prey. Considering this argument, Irigoien et al. 2014 determined that mesopelagic fish may be using about 10% of photosynthetic plankton for energy. Irigoien et al. 2014 showed that the biomass of mesopelagic fish, as well as their usage of energy in the open ocean food web, is much greater than previously thought. Due to the impact these two findings would have on ocean ecosystems and chemical cycling within them, scientists must make further and more accurate investigations regarding the mesopelagic fish community. 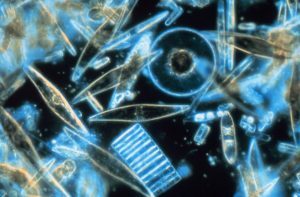 /wp-content/uploads/sites/28/2014/03/Diatoms_through_the_microscope.jpg 1180 1796 l.vandermeiden https://blog1.miami.edu/sharklab/wp-content/uploads/sites/28/2018/09/Um-Shark-Research-logo-2018.jpg l.vandermeiden2014-03-07 09:33:212014-03-07 09:33:21Fish living in the “twilight zone” have a greater biomass than previously thought. 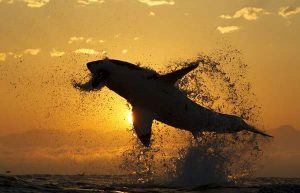 When most people think of shark week, the first image that comes to their head is one of a Great White Shark soaring into the air in pursuit of seals. What most people may not know is that the man responsible for these incredible images is Chris Fallows. Chris began tagging sharks in South Africa in 1989 and with the help of local fisherman, was able to tag and release over 1500 sharks and Rays. It wasn’t until 1996 however when Chris and a fellow colleague discovered the fierce breach hunting tactics of the South African White Sharks. Chris uses this combination of location and time around sharks to educate and expose people first-hand to the awesome beauty of these apex predators in their natural environment.